If you’re looking to replace your kitchen countertops, there are several things to consider before you get started tearing out the old ones. You can have what would appear to be a simple job go very wrong if a few important things aren’t taken into consideration. Read on to find out how to ensure you have the best possible experience when it comes to updating your countertops. No matter what kind of countertops you currently have, chances are they’re showing some age! Years of wear and tear – hot pots, stabbing, cutting, and scratching – can leave any kind of surface in bad shape. If you are thinking of repair instead of replacement, consider what you currently have. If it is laminate, usually it’s a simple screw-into-place that can be removed easily. If you have stone surfaces, they’re easier to replace because of the cost and time to repair stone, but they are much heavier and time consuming to replace. You have to make sure that your cabinets can support the weight of your new countertops. If you’re going lighter, this isn’t a big deal. If you’re switching to stone or cement, you’ll want to make sure that you’re not going to cause any kind of damage before purchasing and placing the new countertops. Are you going to be replacing the cabinets soon? If so, consider waiting until you’ve done that to install your new countertops. For example, if you’ve put in stone countertops a fabricator may not be willing to remove them because stone is fragile. You may also find difficulty with other heavy materials like quartz, cement or granite. Any time you replace a countertop, you have to consider the impact it will have on your sink, your faucet, and your garbage disposal. 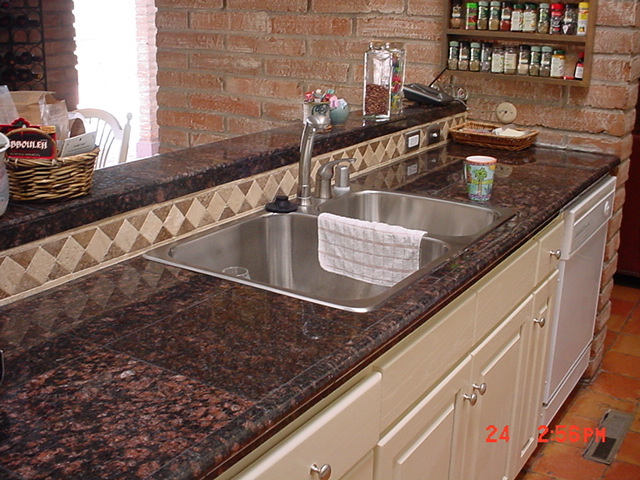 Quite often this means replacing those items, unless the existing sink is mounted under an existing stone counter. Plumbtile has many products available to assist you in making sure your new setup works right the first time, everytime. You’re going to need a new backsplash! This is another fun aspect of replacing countertops – getting to pick out the backsplash. There are so many unique options available. Some companies offer their customers the opportunity to design their own using tile or glass. Be sure to look at what is available to you! Appearance is usually the main reason people replace their countertops, so making sure that they will go with your current appliances is very important. If you plan to get new appliances make sure they fit the new theme and feel of your kitchen. Another importance appearance factor is lighting. If you have lights shining down directly on to a surface that is reflective, chances are you’re going to cause yourself some headaches from eye-strain. This also goes for under-cabinet lighting. Make sure you shop smart. It may seem less expensive to go with a pre-fabricated countertop but you may end up with something that doesn’t last as long. These types of pre-cuts do not take into account your homes’ wall changes or where you would like the seam of your countertop to be. In the end, making sure you have a professional installation and the design that suits you will ensure that you have something you will want to keep for years and that will last for years. Be sure to visit Plumbtile to see the countless options they offer for you and your updated kitchen!